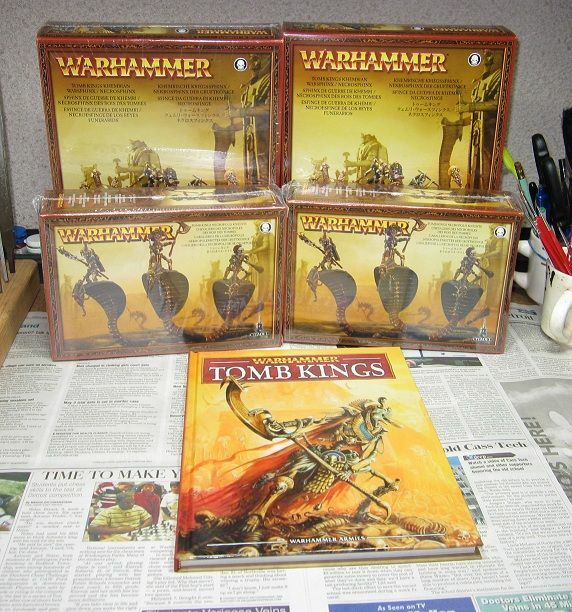 Let me start off by saying that I tried to sell off my Tomb King army this last week. Why? I already have a lot of armies and I wasn't feeling like starting another one right now. I was also not sure if I am still interested in playing WH Fantasy. Anyway, I got no buyers for it and there was nothing I was interested in trading for it, so I decided to keep it. I picked up the new book from my FLGS last night, as well as two of the new Warsphinx kits and two of the Necropolis Knight kits. They did not get any Tomb Guard in yet, I have to wait until Friday for that. I plan to use these kits to build a Necrosphinx, a Warsphinx, three Sepulchral Stalkers, and 3 Necropolis Knights. I will probably pick up a second box of NecroKnights at some point so I can increase the Knight unit to six models. Now I just need to sit down and read the book so I can decide how I am going to build my army. Having taken some quick scans through the book, it seems like there will be a couple different builds to choose from. I think I am leaning towards a Skeleton horde army. I found a Tomb Kings forum where I can get army advice from other TK generals. I am getting bit by the Tomb King bug myself! The theme of the army is just so cool. I have been reading that forum all morning as well. Brad is it safe to say you will have all of the fantasy armies as they come out? lol. I am trying out the newer / more balanced books to find one that sticks. I had a chance to pick up a Daemon army but that is more of just the same cheese. I really like the theme of the Tomb Kings, though their reliance on magic may make or break the list. Slipwing, we will have to get some games in if I finalize the deal I am looking at to practice with the Tomb Kings.